The story quickly builds and events lead to our favourite wheelchair bound professor and some of his student being kidnapped and a web of brainwashing plans are set in motion eventually threatening all of mutant kind in a way so serious that Magnito and the X-men are forced to work together and even find common ground as they do. Well, that about sums it up. Beware spoilers may be found ahead. The art work is wonderfully detailed and character facial expressions take centre stage. Although the art does fit inline with the 80’s styles that you expect to see, it is a wonderful example of that style with some additional attention paid to edge lines and backdrops. The story is told at a good pace and as a reader I really empathised with Maginito. 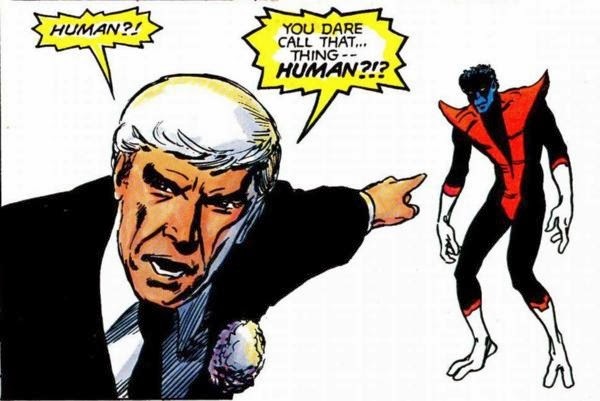 Right from the start he is written as a rational and empathetic person right from his entry into the story (Something very unusual for villains of the 80’s) in fact he appears to be more involved with the events than the x-men. The motivations of everyone in the book are clear and understandable; each member of the cast has their own personality and reasons for being on the side they are on. No Mary Sue style none-person’s that you can find in other 80’s works. Every character is written in a way that gives them actual personality that fits in with the established Marvel lore. Some of the dialogue is so good that it made my toes curl. The preacher begins a speech at the end of the book that makes me almost see his point of view. Then when he turns to Night Crawler and venomously spits the words ‘how can you call that human’ you can’t help but feel for the fuzzy blue elf. The book really hits its mark when it comes to showing the parallels between the anti-mutant movement and traditional racism/discrimination. A point that I think would have been even more poignant at the time of writing. There are a few plot devices that baffle me as a reader. I am pretty well versed in the X-men lore at this point but I was left scratching my head at the concept of a piece of ‘earth’ technology that dampens Xaviar’s field of psychic view. Especially as it appears that it works by flipping a switch. It’s a flimsy concept at best as in every story I have ever read that featured a device of this kind Xaviar has been instantly aware of it as he suddenly felt ‘head-blind’ however in this case its gone unnoticed. All that said, I can see how it was a decision made for the basic ‘logic’ of the plot, hiding the fact that Xaviar is pretty hard to outwit. The next think I took issue with happened later in the book where the crazy assumption by Magnito was made that electrocuting his seemingly dead allies would be the best way to wake them up from their coma. Then there is the question about how the master of magnetism some how generated a controlled burst of electricity. I realise magnetism and electricity are somewhat linked but this kind of thing is well outside his wheel house. It’s one of the best ‘classic’ X-men stories I have read and definitely stands up to the current generation of books. It’s powerful and unique. It’s great to see the X-men fight a human foe for a change and the fact that he almost won reminds you that with all their powers and abilities mutants are not unstoppable, something the main villain in the book should have had a long think about.